J = Junior Service Cord (250-300 Volts)? 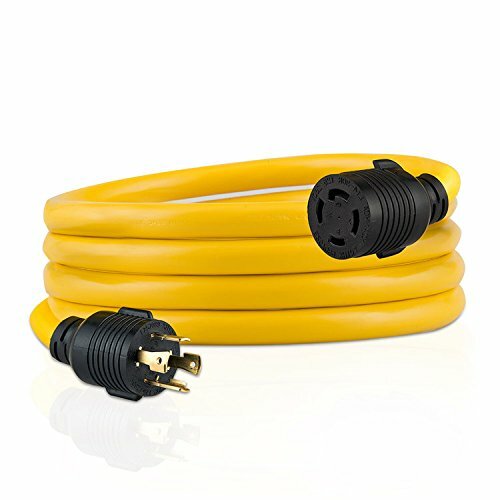 The plugs was design with the lock structure.When the plug is inserted and twisted to lock place,it will not slipping from the generator socket due to wind, hurricane,big rain, snow, This is the best extension cord for your generator to connect with home appliance and electric power tools. The big gague and pure copper can avoid the cable getting overheating from long -time use.It is a useful and reliable emergency extension cord for your generator. If you found any problem of our cable pls email us,we will feedback you in 24 hours. TWIST LOCKING DESIGN The plugs was design with the lock structure.When the plug is inserted and twisted to lock place,it will not slipping from the generator socket due to wind, hurricane,big rain, snow, This is the best extension cord for your generator to connect with home appliance and electric power tools. HEAVY DUTY The big gague and pure copper can avoid the cable getting overheating from long -time use.It is a useful and reliable emergency extension cord for your generator. 1 YEAR QUALITY GUARANTEE AND 3 YEAR CUSTOMER SERVICE If you found any problem of our cable pls email us,we will feedback you in 24 hours. If you have any questions about this product by Yodotek, contact us by completing and submitting the form below. If you are looking for a specif part number, please include it with your message.